A little over a month ago, I received a marketing email about a game being developed called Oniri Islands – Children of the river. I immediately responded with my interest in helping review this product for two reasons. First, Livingdice.com has always been interested in the merging of tabletop gaming and technology. But second, was that this was a Toys-to-life game, geared toward kids. Since I have kids I am trying to get into gaming, and one already loves T-T-L video games, this was a “must try”. I was provided a prototype version of the game for review. Here was my experience. Oniri Islands is an adventure style game focused on exploration, interaction, and solving puzzles. 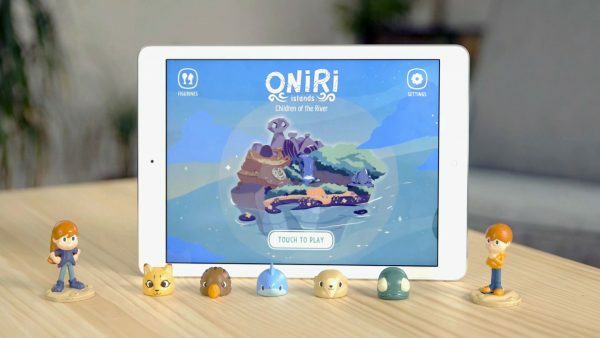 Published by Tourmaline Studio of Geneva, Switzerland, Oniri Islands is a co-op digital boardgame hybrid (part board game experience, part video game experience). It’s target age range is families with children 6 to 10 years old. I played with one of my sons, who is 5. He loved this game. 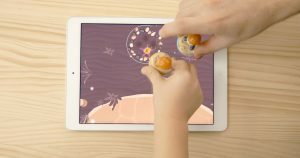 You play it on a tablet (iOS or Android) and use real toys to control the action. For my play, I used an iPad Air 2. The screen size was good, but we had to be careful to orient play mostly toward our own sides of the screen, else our arms and hands would get in the way of each other. They say the game supports the iPad mini 2. But, my feeling from playing on the Air, is that the mini screen would just be too small. The iPad pro would be perfect for a game like this. The Oniri Islands toys are pretty cool. They have tactile patterns on the bottom, that are recognized when you hold them on the screen. There is no bluetooth, RFC, or anything requiring power. You move the toys around your screen as your game pieces, which translates into movement in the game. I had a bit of a problem keeping one of the toys to stay connected to the screen, and often had to lift the toy and replace it to re-synch. Thankfully this is a quick and painless process. And, my issues most likely came from my figures being prototypes. This should not be an issue with the production toys. I have to give this game a big thumbs-up. When I first launched it (by myself to test it out), I found the dialogue to be a bit over-the-top. However, when my 5-year-old experienced it, he was drawn to it instantly, and really understood and engaged with the game. So, kudos to the production team for designing it the game to a kids interest and level. It isn’t just pretty pictures (and it is very pretty). The game play was fun, as we each controlled a character and had to move around the screen as a team to solve puzzles and goals. One early goal that provided a lot of enjoyment was trying to find the components to start a campfire. We had to move across the map together and try to find where these items were hidden. The game was an appropriate difficulty for a kid and simple, but still fun, for an adult. But let’s be honest, I was not playing this game for the game, I played it for the experience of playing a game with my kiddo. The same reason I will sit down and play Candyland with him. Oniri Islands is about 1000x more fun than Candyland. The game is launching in Q4 2017, however it is running a kickstarter that closes April 18, 2017. They have some pretty cool special edition options available. On the Kickstarter page you can also find more pictures and gameplay examples. But, overall, this is a great game for a parent and child, or two children, to sit down and play together. It is simple, yet engaging. It is beautiful and fun, and the toys make a new way to experience gaming on your tablet. ← Crit Hit Offers Free Badge and Cash for Phoenix Comicon 2017 RPG GMs! Are Local Game Conventions a Dying Institution? June 14, 2008 trask Comments Off on Are Local Game Conventions a Dying Institution?